At least nobody threatened to beat me up. That’s what happened the last time I wrote about the conflict between Palestinians and Israelis. The man who left the threatening message on my phone was angry because he felt I was attacking Israel. Over the years, I’ve learned that no issue I write about riles people up more than Israel-Palestine. I can count on getting angry e-mails each time I do it. At the end of that column, I indicated I was interested in sharing perspectives from members of the local Jewish community. I got a number of responses, on both sides of the issue. 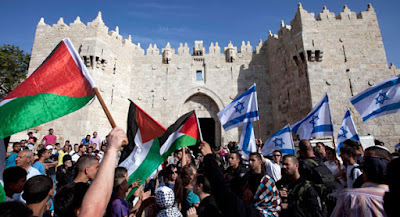 “For decades, polls show most Israelis seek peace and are willing to make major compromises to achieve it,” wrote Adam Levene on behalf of the Jewish Federation of Winnipeg. Sidney Halpern noted that Israel has no recourse but to defend itself when attacked. Other members of the Jewish community indicated their support for MCC’s campaign. Conversations like that won’t bring peace to the Middle East, but maybe they could create a little bit of peace and understanding right here in Winnipeg. From the Nov. 10 Winnipeg Free Press.